Our ethical and systematic approach to our services guarantees you consistency and dependability. We pride ourselves on our ability to get you the most out of our suppliers. Whether it is Footlock bracing or HouseGuard waterproofing products, we only use those that produce the standards we demand. We believe that no warranty does enough, it does not compensate for lost time, frustration and inconvenience. However we believe in our company and what it stands for, and our hope is that our approach to service makes our warranties much more valuable. When we chose a waterproofing system, we wanted to incorporate the new industry standard, Dow® Styrofoam® Board. This product will not compact during the backfilling operation thereby maintaining its R-value. Dow® Styrofoam® Board also wicks water away from the foundation to the Drain Tile system. 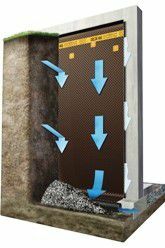 Many products used, including the fiberglass insulation, lose their R-value when compressed during the backfilling process and act as sponge for the water keeping it close to the foundation. With Sierra Concepts’ commitment to ethical, high quality products and services we are proud to apply the HouseGuard™ waterproofing system or Cosella-Dörken Delta®-MS dimple board waterproofing membrane. This system uses HouseGuard’s™ TruDry XG™ waterproofing membrane. It’s a water-based polymer-modified asphalt membrane spray-applied to exterior concrete foundation walls and protected with Dow Styrofoam® water-channeling rigid insulation boards. 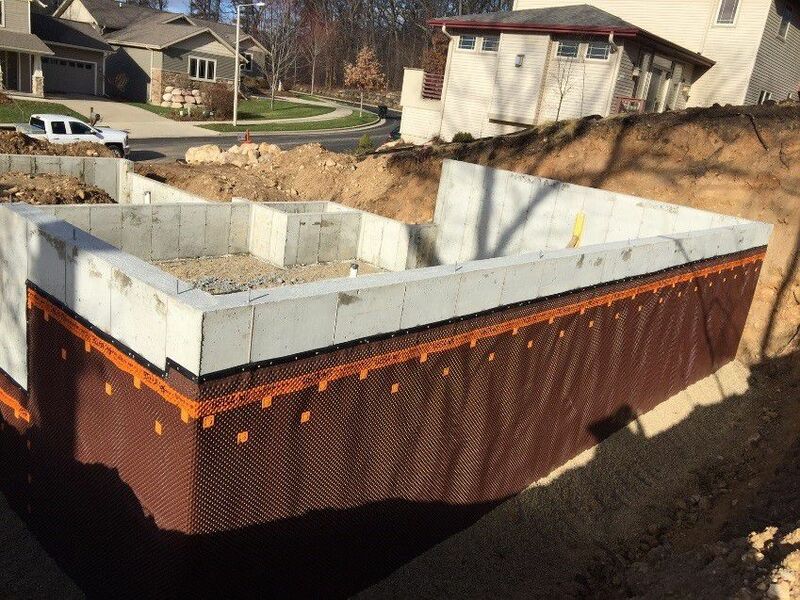 It's an environmentally friendly, low cost, elastic waterproofing barrier that protects your basement against water leaks by bridging non-structural cracks and resisting hydrostatic pressure. This product is sprayed on easily and cures to a minimum film thickness of 40 mils. HouseGuard’s™ system waterproofs, insulates and drains water away from the basement. DELTA®-MS is an 8mm dimpled HDPE (High Density Polyethylene) membrane that utilizes an "air-gap" between the foundation wall and the membrane, which acts as a capillary break to stop water from reaching the foundation wall. This unique design provides drainage by gravity for any condensate water from drying concrete, or other incidental water which directs it to the foundation footer and then to the outflow drain lines. DELTA®-MS is easily installed by unrolling the membrane against the foundation wall. DELTA® Accessories allow for quick and effective fastening of the membrane. The top-edge of the product is sealed and protected against intrusion of soil particles or surface water with specifically designed profiles. After applying the membrane, we can complete the waterproofing system by applying styrofoam insulation that is designed to minimize cost and offer maximum value in insulation from heat and cold, water drainage and protection against wall damage. In addition to offering our two waterproofing systems, we can provide other alternatives to assist the builder with their project. 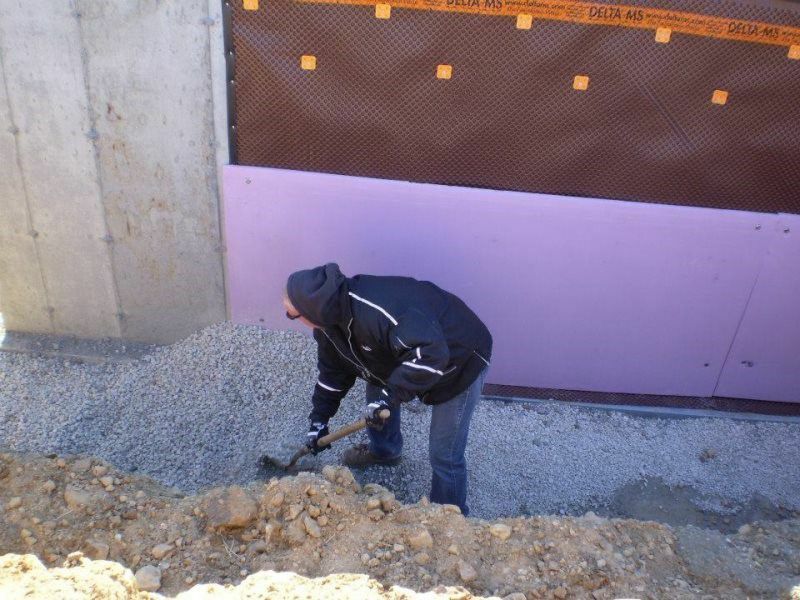 The services include, but are not limited to, install sealed sump crock pit, install interior/exterior drain tile, install footlock bracing system, install window wells, and apply Tuff II insulation coating. Please feel free to contact us if you are interested in these additional services.